The Courtyard Los Angeles Hacienda Heights/Orange County is located across from the Puente Hills Mall in the City of Industry. 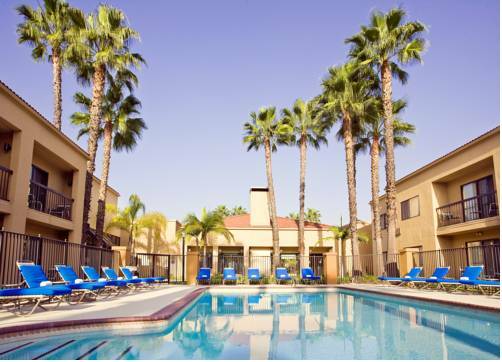 Guests enjoy easy access to I-60 freeway and local attractions such as Cal Poly Pomona, Mt. SAC, Brea Mall, Hsi Lai Temple, Raging Waters and Disneyland. Our hotel features a state-of-the-art lobby with flexible, inviting work spaces and The Bistro - Eat. Drink. Connect., serving healthy and delicious breakfast and dinner options as well as Starbucks beverages and evening cocktails. Guest rooms at our Courtyard hotel in Hacienda Heights feature comfortable beds, spacious work desks, ergonomic work chairs and complimentary high-speed wireless internet. Each of our rooms also includes a mini-refrigerator and television with CNN, HBO and ESPN. During downtime, guests can relax in our outdoor pool or enjoy our well-equipped fitness center. Host indoor or outdoor gatherings in two event rooms or our beautiful courtyard. Book your stay at our Marriott Hacienda Heights hotel today! ~17 miles from Hacienda Heights.